← How About The Power Of The Sun? Thanks to Peter Gluck for pointing out the Solar Hydrogen Trends’ (SHT’s) Patent. When I read the first paragraph of SHT’s patent application, one word instantly came to mind: Sonoluminescence. The process they were describing for how their super fantastic hydrogen-producing reactor works sounded a lot like sonoluminescence to me. Reading further, my suspicions were confirmed. The Symphony 7A Reactor really is a sonoluminescence device, which probably explains where the word “solar” in SHT’s name came from. Sonoluminescence – The technology behind Solar Hydrogen Trends’ Symphony devices! The “Symphony 7A Reactor” is a multi-factorial hydrogen generator created by SHT. It is thousands of times better than any electrolyzer on the market and could single-handedly reshape the entire world’s energy landscape. In one hour, the hydrogen reactor generates more than 17kg of hydrogen (equivalent to 51 gallons of gasoline) at 96.7% purity from only 5 gallons of water. The electrical output equivalent from an input of 414 Wh was calculated to be 626 KWh or a COP close to 1,500 times. That is 1,500 (one thousand five hundred) times more energy produced than input, at a cost of $0 if coupled with Solar. According to SHT, the process involved in the hydrogen production is more than simple electrolysis. It is a combination of 16 physicochemical processes that work together in unison to convert water into mostly hydrogen. Hence the “Symphony” naming of the reactor. There is a small quantity of Nitrogen (1.3%) and Oxygen (1.9%) on average in the reactor output verified by the TRC Solutions, one of the most reputable gas measurement companies in the world. Hydrogen, I have to say, is the most promising energy source not only because it can be used in Fuel Cells and Low Energy Nuclear Reactions (LENR formally known as Cold Fusion), it can also be used in internal combustion engines where the only by-product is water, which can once again be run through the Symphony 7A to generate more hydrogen. So what exactly is Sonoluminescence? Sonoluminescence, first discovered in the 1930s, is a phenomena that converts Sound into Light. It can also be regarded as the supersonic implosion of sonoluminescing bubbles. Like its nephew, Sonofusion (deuterium based), it occurs when a sound wave of sufficient intensity induces a gaseous cavity within a liquid and causes it to collapse quickly. Early observations noted that bubbles in a fluid were emitting light when an ultrasound was turned on. The light flashes from the bubbles are extremely short; lasting between 35 and a few hundred picoseconds. 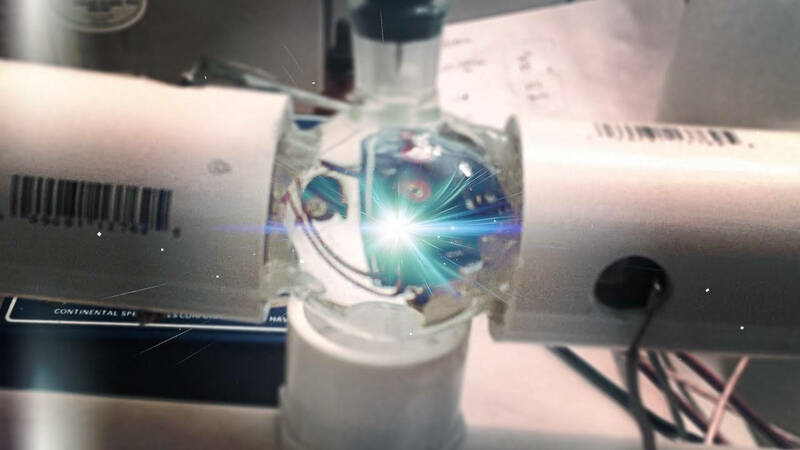 When multiple bubbles are activated simultaneously, this is known as multi-bubble sonoluminescence (MBSL). From left to right: bubble appears, slow expansion, quick and sudden contraction, emission of light. (Wikipedia). 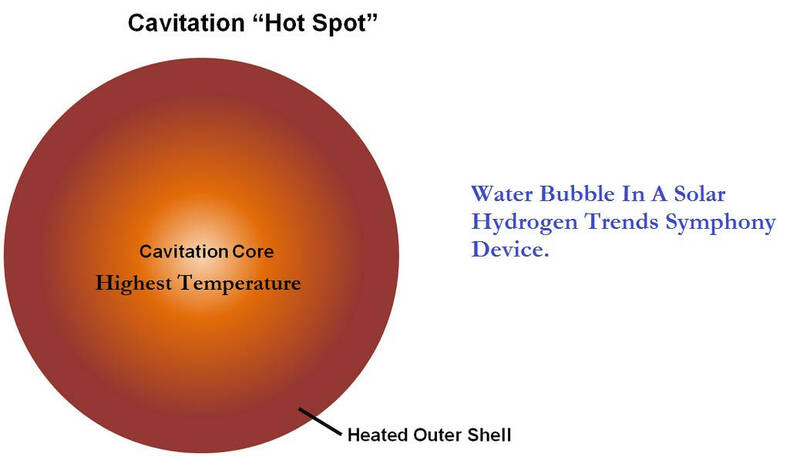 Each bubble contains a high temperature ionized plasma core. During bubble collapse and resulting shock wave, the inertia of the surrounding water causes high pressure and high temperature, reaching around 20,000 Kelvin in the interior of the bubble, or 40,000 0C according to SHT, enough to melt steel. Sonoluminescence has been around for a while, SHT were just the first to realize its potential in making hydrogen. Kudos to them for the insight. Below are some of the details that can be gleaned from Solar Hydrogen Trend’s patent. Heat – Reaches 40,000 0C. Catalysis – Titanium was preferred. Turbulence – Water turbulence helps remove gas bubbles from electrode surfaces. Electrostatic Field – Negatively charged hydrogen ions move toward the positively charged outlet. Pulsed Electromagnetic Field – Has effect on pressure. Light – An effective tool for the decomposition of water molecules. All this makes me all the more convinced that Solar Hydrogen Trends truly have something special in their hands. The technology is commercializable based on their working prototypes. If only they would push forward and get it to market without wasting any more time. This entry was posted in Uncategorized and tagged Cold Fusion, Hydrogen, LENR, Light, Low Energy Nuclear Reaction, Solar Hydrogen Trends, sonoluminescence, sound. Bookmark the permalink.